Here's the last of the heart applique quilts, and it's so sweet it makes my heart spin! Plus, there's a spinning effect going on in the piecing--so Spinning Hearts is it's name! 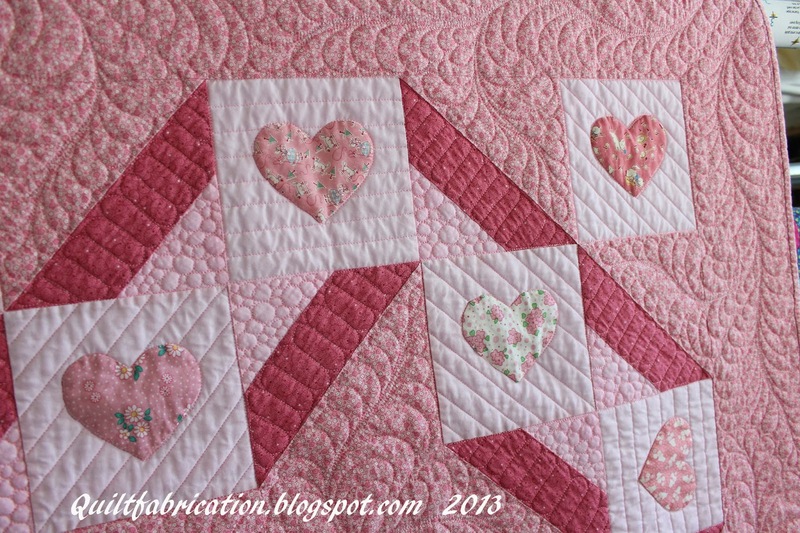 Since this was a super simple quilt to put together, I thought others might enjoy it, so I wrote up the pattern. 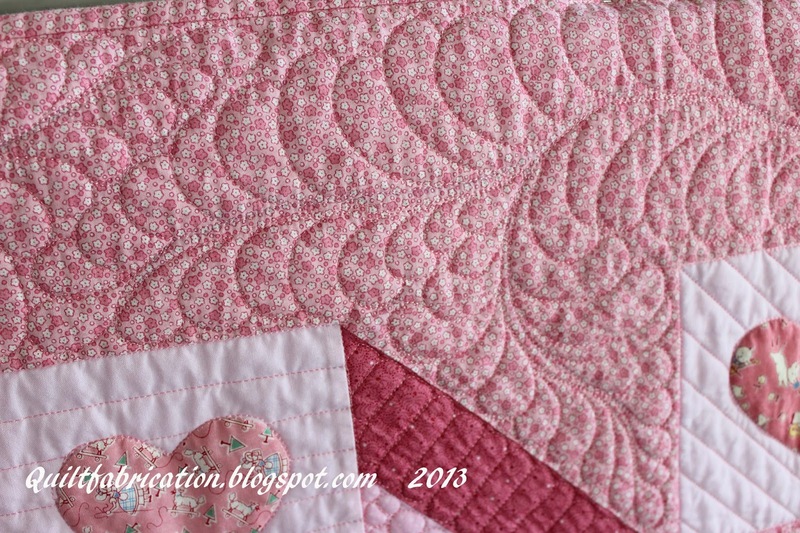 It can be found on my Craftsy pattern page for a small fee. And the beauty of this quilt is that it doesn't have to be hearts--any applique or theme fabric could go in those squares. Someday, when I get time, I'd like to make another with a theme fabric. Someday! 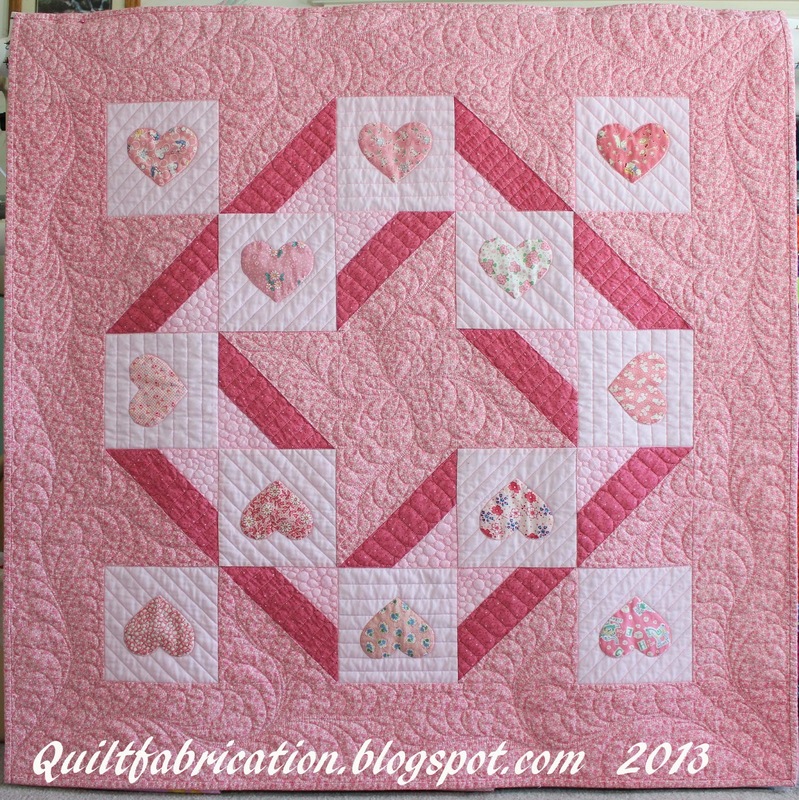 And now for a bit on the quilting. 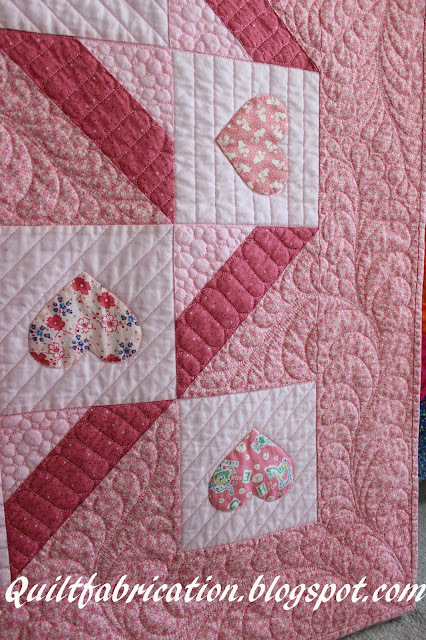 I used my trusty clear vinyl when designing the quilting, and wanted the feathers to be symmetrical around the heart blocks in the corners. I also wanted the feathers on the sides (edge to edge) to be the same on all four edges. So, after I designed the stems on the vinyl, I placed tracing paper over it and traced it in pencil. Then to the sewing machine! With a large needle and no thread, I stitched on that stem line to make myself a stencil. It's hard to see in the picture, but I'm sure you understand! 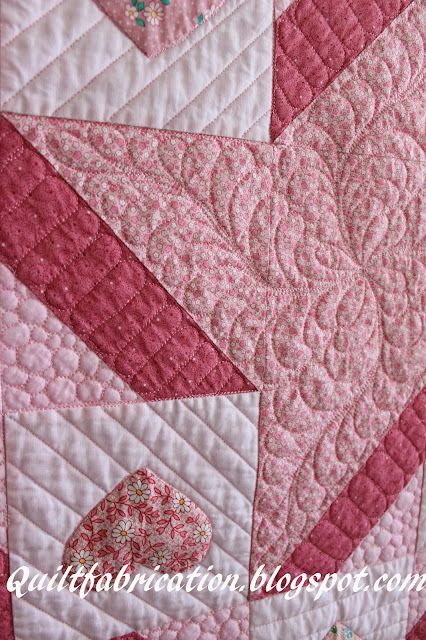 I marked the stem line on the quilt with blue chalk before loading it on the frame, so that way I didn't have to worry about the sides getting misaligned. 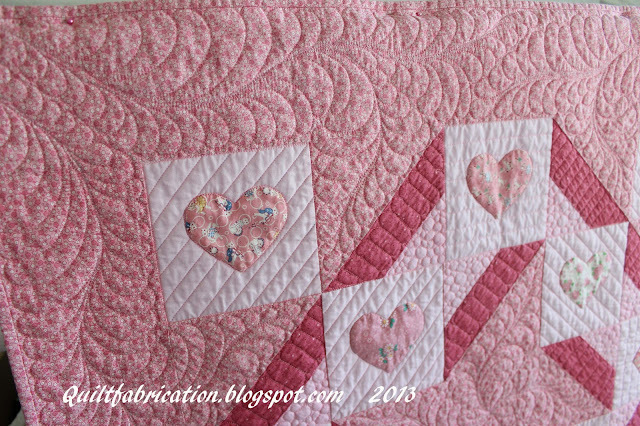 And yes, I did quilt the sides as sides and did not turn the quilt! And for a bit of credit. I would like to thank Dawn Cavanaugh and Angela Walters for their excellent instruction on feathers. Both teach at quilt shows, and of course, Angela has a class on feathers on Craftsy.com which is awesome! So, if feathers are still a challenge for you, I highly recommend learning from these two quilters! gorgeous quilt and quilting! I think I'm going to have to seriously check into the Craftsy classes..